See the following 2 pics. They are the hands of 2 diff persons. You can notice that, under the mercury finger, when the girdle of venus is curving up, the heartline is getting feeble. Also, at the same point there is a dropping line from the line of heart. What is the interpretation here? It will not be proper to comment on incomplete pictures of the palms of the hands. The second picture is neither complete nor clear at all. However, what I can assume is this that it denotes deep sorrow because broken double heart lines have almost the same meaning as the single heart line is full of islands. This is a negative signs to have. Deep sorrow can be due to the loss of a loved one/ estrangement in the family, disappointment in love. Their careers and social lives become generally even difficult. They would have to sacrifice their happiness, interests, desires and ambitions for the sake of others. This can induce persons to think that they had been betrayed. 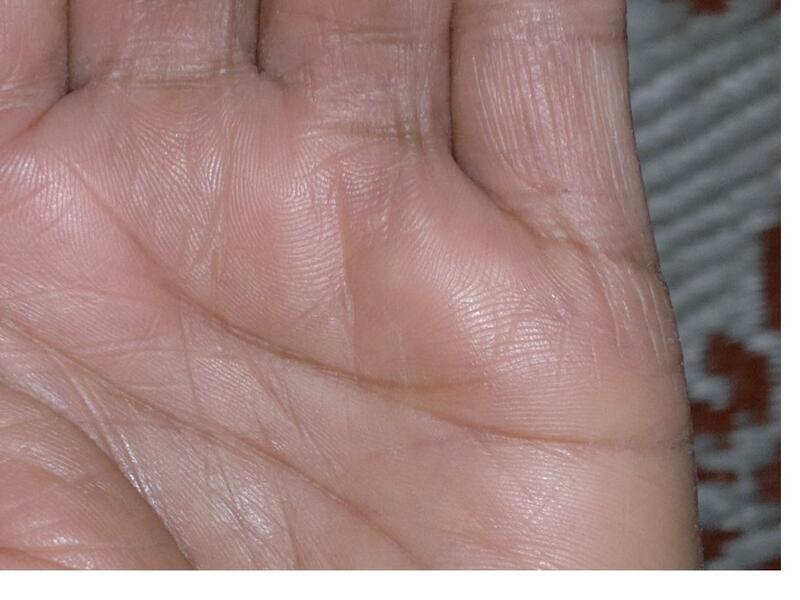 You will find the reasons for having formed such marks on the palms of the hands, if you search. Besides all this, some mental turmoil can also be there due to indecisiveness of the subject.This type of heart line can be due to defective action or very poor functioning of the heart organ due to heredity. Complete analysis will reveal the reason behind this formation of defective heart line. Other lines do matter. 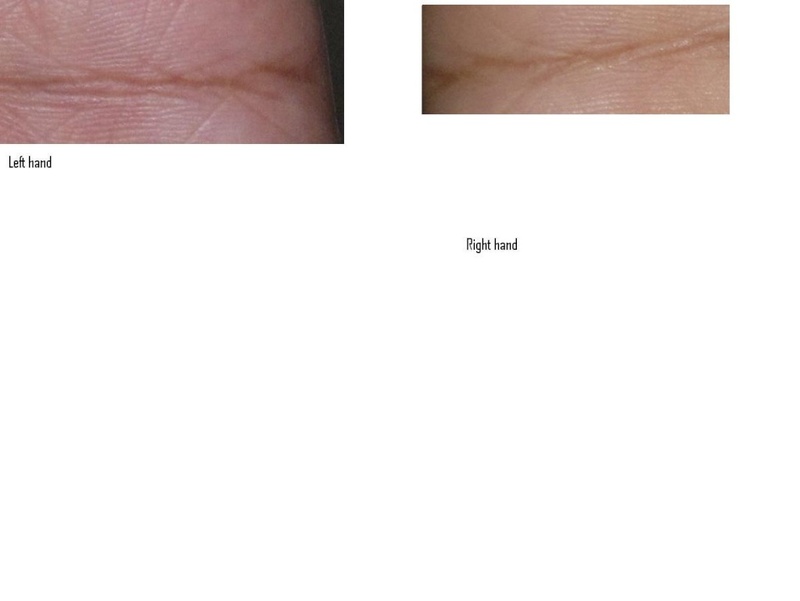 Hands must be analyzed in totality as no sign or mark on palms of the hands is absolute in itself. However, if you know them advice them to have faith in God, go outdoors more often, take simple easily digestible diets and eat fresh fruits and vegetables and try to live proper social lives with good character, have proper sleep; forgiving and forgetting the bad past. This tensed situation will end when heart line takes a better shape of a clear uncut deep heart line. Age can be calculated on the line. I intentionally cut the photos so that the broken part is given main attention. It can be either mal-functioning of heart/ a deep disappointment. 2. At the point at which the girdle of venus is getting lifted under the Mercury finger, there is a break in the heart line or the heart line is becomeing faint. So, there is any connection here? And you're saying that - "Deep sorrow can be due to the loss of a loved one/ estrangement in the family, disappointment in love.". Is it based on the above 2 points? I see no GOV in the first picture. And know that Girdle of Venus can be found on the hands of particularly artistic and intellectual persons too. So this line cannot be termed as bad line always. This uplifting fork right from the heart line is not good for married person, because the peculiar temperament of extra sensitiveness would make him/her more difficult to live with. This can make a person ‘moody’. So disappointments could be there in the relationship. The person would incline to indulge in activities relating to bad Mercury. Other features of the palm will reveal what is what. Here the person usually does not ask for advice so can make grave mistakes. The person is outspoken, impulsive, prideful and angry up to the limit of hysteria. The person can adapt violence if people do not do or think according to his/her wishes. However, in the second picture I can see a ring of Apollo that indicates a blockage of creativity and potential for sadness or depression. This is also a negative line. Thanks for asking. My above comments were for the first picture person and you posted another picture.There were many reasons for saying so. And there is a great difference in thinking pattern in both of them. Would you be able to ask the 2nd person, with the broken heart line under the little finger, if he grinds his teeth or has TMJ - or any other issue with the back of his mouth/teeth/jaw/neck? I have found over the years that the heart line is related in many ways to the mouth area and how we hold emotional tension there. please, could we discuss the hands seperately. I'm more interested in the first, because I have some scruple to discuss the very sensual 2nd. The first shows important life changes ( mentally an emotionally) during the adulthood, may be due to the influence of (a) young person. there is also a possibility to have a kind of an overlapping, doubble relaionship for a time. After leaving the former, older getting stronger of the new with more happiness. - Do you know details of the life of that person? How old is he/she? - Probably he/she's in the middle of the change of his life now. "I dont grind my teeth... but my teeth was not properly aligned, due to which I had few prob... which i got rectified." Now, she doesn't carry any problem on tooth. yes, I know the person very well and she is in her near 50's now. As such, there was nothing like double or overlapping relations of this person. However, there was a heart breaking incident where her husband lost the business and they were deserted from a economically well settled family! Then they relocated and carried the life as a daily wage worker for 4-5 years. She took the responsibility of the whole family as the husband wasn't working. That was it. This all happened during her near 30's. that was the situation, like a second start mentally and emotionally. It can also be a kind of start with the same person, love, relationship again but under really different conditions. The time of change you mentioned is interesting. Mentally I would say the change lasted a little bit longer, until the beginning of the 40ies. The change around 30 - the beginning of the 2nd Saturn rhythm - would be also interesting for a looking at the astrological charts. I would await that there is also a big difference between the mother's and father's clan. The father's side is probably much more stable. Manfred, what do you mean by - "I would await that there is also a big difference between the mother's and father's clan. The father's side is probably much more stable." ...that the characterization of the both clans is very different. Small correction. Just got to know that the incident happened during her 34-35th of age. And yes, it was lasting till her 41st-42nd age. ...I would await, that the problem begun before 34-35 and it was a creeping process that than came to the climax. Thank you Kiran for the feedback. Now I wonder if the first person had a similar issue with teeth alignment? I doubted the grinding although I suggested it, because that usually leaves pits in the heart line, but I was definitely suspicious of teeth. I already checked with 1st person also . She too had a tooth problem. She had sensitive tooth( the last one inside the mouth). She had some germ attacks and it became sensitive. She wasn't able to eat anything on that portion of the tooth. She got it removed recently( couple of months back). She also had on the otherside( in the middle) too a sensitive tooth 'coz of germs attack and that was also removed around few years back. She is also sensitive to couple of food items, which if she consumes, she develops mouth ulcer. B.t.w. does this related to the break in heartline in left/right hand or both hands? 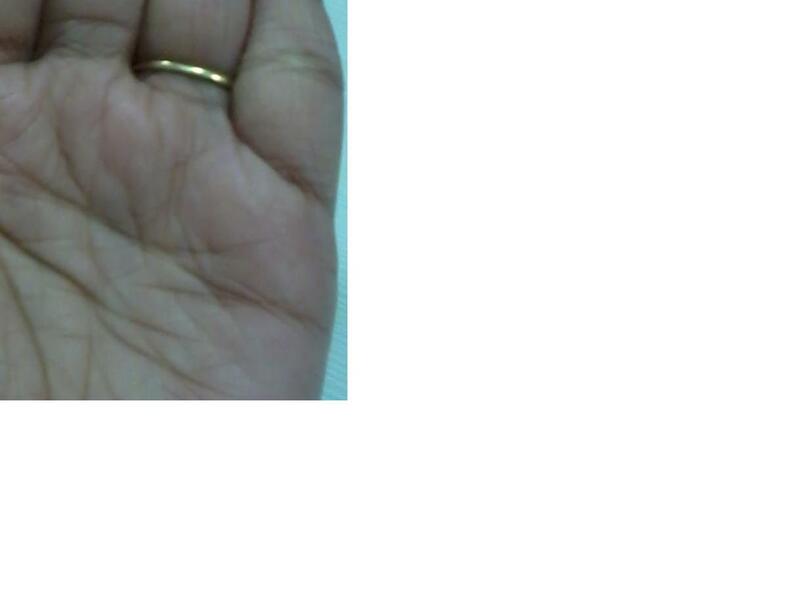 To add another confirmation, I too have criss-cross and overlapping heart line under the mercury finger in both the hands as is shown in the following picture. I too have sensitive tooth and develop mouth ulcer and cough often. Do you consider the following kind of pattern also as the indication for mouth related problems or its only w.r.t. breaks? Kiran.Katawa wrote: I already checked with 1st person also . I've notice pits can represent cavities or a tooth that needs looked at. A number of pits can be grinding or pressure. The broken line(s) can be misalignment. If you're around any teenagers with braces, take a look at their heart lines and compare to the teeth that are being repositioned by continous pressure, minor adjustments may not show up, but others likely will. p.s. : I wouldn't attribute the cough or mouth ulcers to the chained, overlapping heart line. Chronic coughing can be noticed in the nails, particularly the thumb nail. It'll bend at the tip when it grows out. Yeah, in the first case, the woman had caries( wasn't getting the term yday). Its actually a pit, which is filled up with germs and turned black in color( the filled portion). B.t.w. 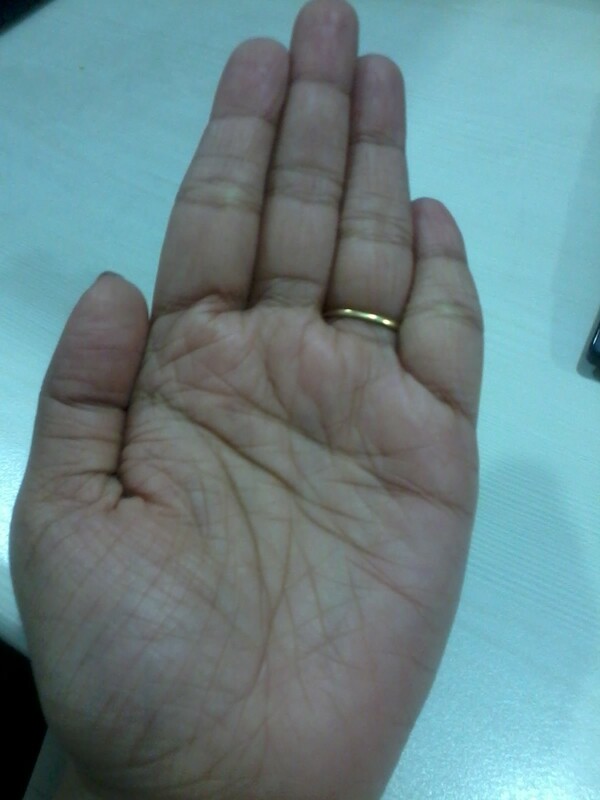 does the hand matter, in which these lines appear? Thank you for the other info. Front teeth can show on either or both hands, but the side and back teeth relate to the same side of the body. It's like headaches show in the head lines, tooth aches can show in the heart line. Inflammation in the mouth can be connected to inflammation in the heart. Inflammation in the heart is the leading cause of heart disease. I made this connection in the heart line many years before the science was there to back it. Well, you certainly aroused my curiousity as to your scruples about discussing the "very sensual 2nd". In another current discussion there is a question about destiny and the markings in our hands. Would you say that these types of heart lines relate to a certain type of emotional or relationship predetermined experience? ...... While thinking about that for a moment, it certainly makes you wonder about a soul's journey and reincarnation. I'm not shure if I may really answer your question: Because there is no duty here in any kind to answer I usually make only statements about hands if I "like" in any kind. Here we have a really complicated hand and "fate". If we use categories of reincarnation I think, there are many signs in every hand. The same will be shurely with the second hand here. I find several signs of sensuality here, for excamples the full basics of the (little) fingers, the big mount of Venus, shurely the red heartline. - The lowest part of the Saturn line. = Very restricted early youth (around until the 4th year). Sometimes living with the grandparents, in a very small home or a kind of orphange. Sometimes we find a gloomy pregnacy of the mothere here. Thinking in the former categories we have within the first 7 years a kind of replic of the life before. - The headline speaks about a big change of situation, usually in combination with some remarcable events. Here we could go on, but If you think about reincarnation we would say there is lot of work on it in this life.